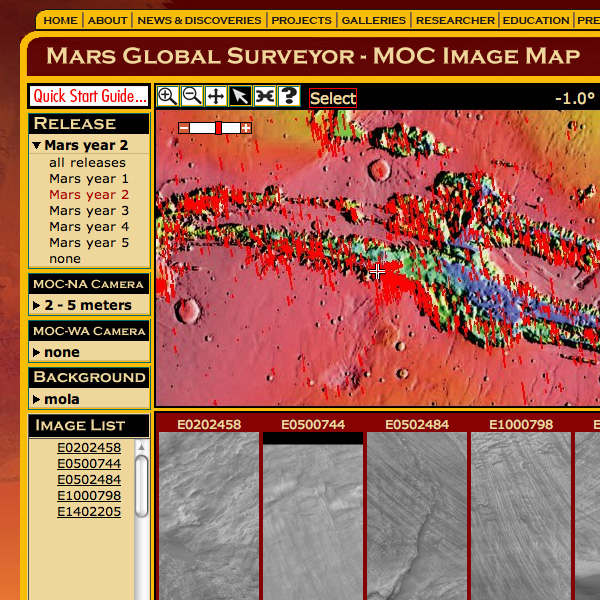 MAP TOOL Searching for images of Mars taken from orbit has become a lot easier. By clicking and zooming on a map, anyone can isolate an area of Mars and check out what images exist for that area, as taken on past and current missions to the Red Planet. Researchers at the Mars Space Flight Facility at Arizona State University are building map-based tools to speed access to images and data from current and past missions to Mars. Additional data sets include the Context Imager (CTX) and the HiRISE Camera on the Mars Reconnaissance Orbiter. Data sets from other instruments, such the High Resolution Stereo Camera (HRSC) on Mars Express, are planned. 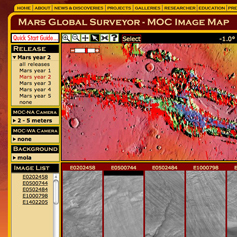 Another software tool, JMARS, is a Java-based application developed at the Mars Space Flight Facility. It lets users combine multiple data sets taken from many missions and instruments into a single image.